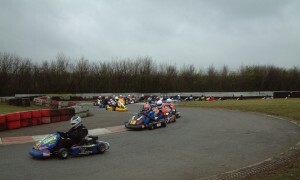 A massive turn out of nearly 40 teams were greeted by cloudy skies and the threat of rain for this, the first round of the championship. Team X out qualified Lakeside by just 4 hundreths of a second with Team Zaremba and DBR-Egelm/McGee making up the second row. With some of the top endurance teams in the UK, competing alongside new comers to the championship, a massive 6 seconds deficit between pole and last place, highlighted the quality of the front end of the grid. Right from the off, Team X and Team Zaremba were locked together at the head of the field, DBR lead the chase from Focus Racing and Lakeside with fabcar.co.uk, Grassroots, DBR-Howland, Appliance and Kartoon making up the top 10. 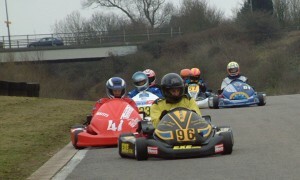 There were no early casualties within the first hour, demonstrating the quality of kart preparation for this championship and the top 20 teams were all still showing as being on the same lap. Team X and Team Zaremba were still bumper to bumper with Focus Racing moving up to 3rd place some 40 seconds adrift and just in front of fabcar.co.uk, Kartoon and Lakeside. With quarter distance completed Team Zaremba made a tactically early fuel stop temporarily dropping them to midfield whilst the lower end of the leader board saw 15 Degrees North, Red Flag Racing, Moutli-Skilled Motorsport and DBR-Howland all making unscheduled stops with an array of mechanical problems. With all teams having completed the first of their mandatory fuel stops Team X had now pulled a 40 second lead on Team Zaremba, DBR were back up to 3rd in front of Focus, Lakeside were now 5th with Fabcar, Chatburns and TGSR in close attendance. Rain clouds were now threatening as SZR pitted for a major mechanical problem which would eventually force them into retirement, meantime Team Zaremba had closed the gap up to Team X and eventually took the lead with just under 3 hours of the race still to run. The light drizzle in the air then turned to a definite precipitation bringing all the teams in for wet tyres, Chatburns being the first and wisest to take that decision and the changed track conditions, dramatically effecting many teams relative lap times. Teamworx and Gas'n'Go were both having a strong day, hovering in or about the top ten whilst Team Zaremba were now a lap and bit clear of Team X but a fuel stop shy. When the two leaders had completed their final fuel stops, Zaremba and Team X were just 10 seconds apart with Fabcar 3rd and all still on the same lap. Over the next half an hour Team X closed the gap up to Zaremba and with an hour to go regained the lead, when a red flag incident then brought proceedings to a halt. As a result of the Clerk of the Course being slightly unhappy about the speed with which some teams reacted to the red flag, a number of rolling laps under full course yellows took place bring the field more or less in line for the final charge to the flag. Focus made their final stop maintaining their 3rd place position, albeit now 3 laps behind the leading pair, but still a lap clear of Fabcar. Lakeside, Gas'n'Go, Teamworx, Appliance and Chatburns were all still on the same lap and competing fiercely for 5th place. With 20 minutes to go Team X increase their lead over Team Zaremba and had now put in the fastest lap of the day whilst 5th place Gas'n'Go had a last minute mechanical failure which dropped them from 6th to 20th place. With the chequered flag in sight, Team X cruised to victory with a 40 second lead over Team Zaremba and Focus Racing picked up the last podium place, a lap clear of Fabcar.